First harvest – Mumma, Did You Know? 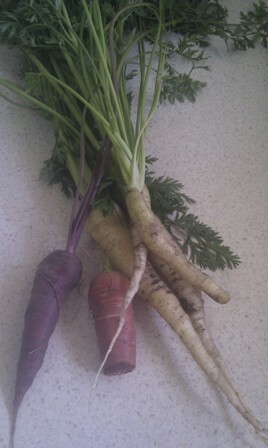 Today I got a bit impatient and pulled some carrots out of the garden. The tomatoes are growing but not ripening yet, so I wanted something out. And there we have it – the first harvest of carrots. This reminded me of why I want to get my garden running at full capacity again – a few months ago these were tiny seeds and now with just sunlight and rain water, carrots! Like magic! I did resist pulling all the rest out. These were the biggest that I could see. I think the rest that are in there might suffer from being overcrowded, which is something to remember for next time. Carrots take up a lot of space and are cheap to buy from the shops, so maybe not the best use of the space, but I think they’ll be good to grow in the future to show little F where his food comes from.